I blame Deion Sanders. Primetime came along just as the modern NFL was born, and with him, cornerback became the type of high-profile position typically reserved for ball carriers and pass-catchers. In the past few years, it feels like quarterback is the only position in football that has inspired more debate about who’s the best. And in a way, it makes sense. For the best corners, the challenge is simple: Stop the guy across from you. If you don’t, there’s no one around to blame. Several of the league’s best corners live on an island (even Richard Sherman’s time in Cover 3 has him playing without a parachute), which explains the amount of ego you see at the position. And in the run-up to this season, the answer is still murky. Sherman didn’t lose a step after 2013, but Darrelle Revis certainly got one back. Patrick Peterson fell off a bit, but a budding star in Denver arrived. There may not be a good answer to the question of who’s the best cornerback in the league as 2015 begins, but that doesn’t mean I’m not going to try to find one. 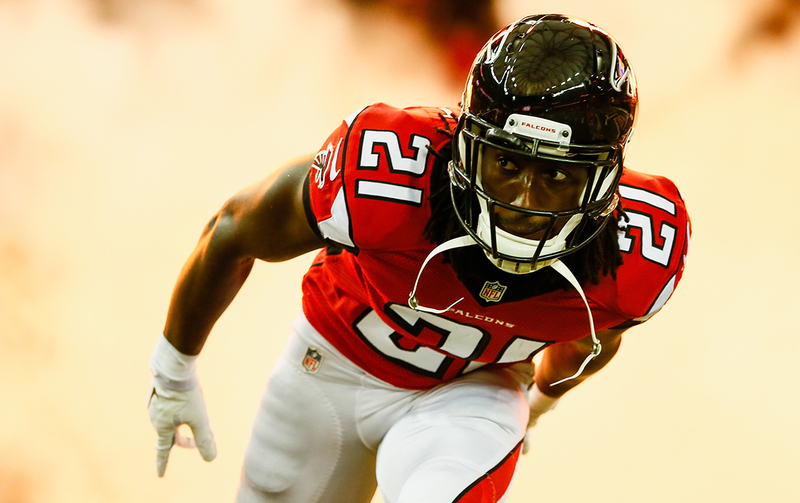 No one has a better chance to move into a different class of corner this year than Trufant. As Bill Barnwell pointed out in his re-ranked NFL Top 100, the Atlanta pass rush was an abomination last year. Only the Patriots and 49ers allowed opposing quarterbacks more time in the pocket than the Falcons, according to ESPN Stats & Info, and the poor pass rush led to plenty of plays on which Trufant could only throw his arms up. Most of Trufant’s 2014 season is on display in this play against Carolina from Week 16. What already makes the former first-round pick so good is his otherworldly ability to change direction. Atlanta was plagued by spotty safety play a year ago, which meant a lot of off-coverage by its corners on the outside. That would typically open up a tempting amount of space for receivers on quick-stopping routes to the outside, but Trufant routinely snuffs that out because of how inhumanly fast he can break back to the ball. He’s one of the league’s quickest corners (a 3.85 in the 20-yard shuttle at the combine put him in the 98th percentile among tested corners), and he also has a knack for knowing how to sit on a receiver’s ideal route. None of that matters, though, when a quarterback is free to roam around behind the line of scrimmage like Cam Newton was here. Atlanta’s pass rush should be improved by some of the changes the team made up front, but the other reason Trufant seems poised for a jump is how much simpler his life may get in Dan Quinn’s defense. With a steady diet of Cover 3 and man, Trufant’s speed and quickness should come to the forefront while his tendency to get lost should fade even further. He’s already a star. He’s about to be a star who’s a household name. What happened to Brandon Flowers over the past two years is about the best anyone could hope for a really good, undervalued athlete. Flowers spent his first six seasons in Kansas City as one of the steadiest — if not the steadiest — corners in the league. As a dependable Cover 2 option, Flowers wasn’t a shutdown defender like Revis, but he was a sure thing at a position where those don’t last very long. The arrival of Bob Sutton and Andy Reid meant a scheme shift in the Kansas City secondary, and in 2013, Flowers and the rest of the Chiefs defensive backs were asked to play considerably more man coverage. That season was probably Flowers’s worst, and after it was over, Kansas City cut a corner who’d spent the past four years playing at a Pro Bowl level.1 San Diego gleefully scooped him up, and before a groin injury in Week 6, he was back to the player we’d seen for so long in Kansas City. Sutton and his staff wanted corners who looked more like Sean Smith (6-foot-3, 218 pounds) than the 5-10 Flowers,2 but while Flowers may never stalk receivers on the outside, he does just about everything well. Few cornerbacks are better tacklers — a product of six years patrolling the flat and erasing yards after the catch — and he can capably play both in the slot and outside the numbers. San Diego knows what it has in Flowers, which is why it signed him to a four-year, $36 million deal this offseason. Two seasons ago, the Chargers had the second-worst pass defense DVOA in football. 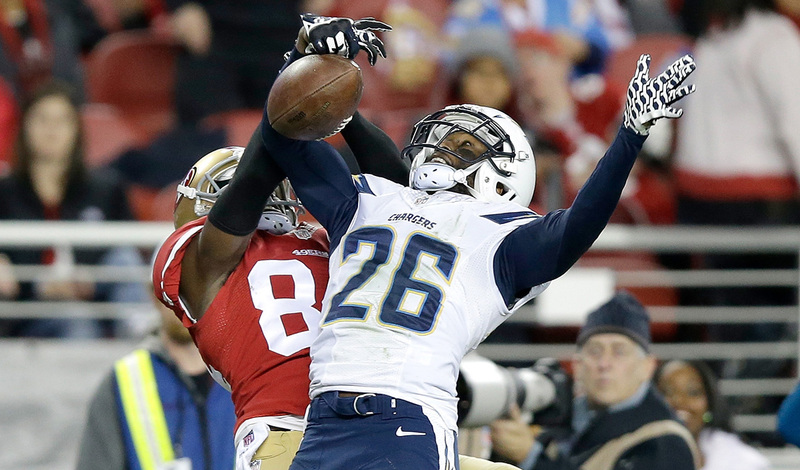 If both Flowers and Jason Verrett can stay on the field this year, those days should feel like a distant memory. When the Dolphins drafted Davis 25th overall in 2009, experts said he had no ceiling, as though he were built in a cornerback laboratory — which makes sense for someone who shares the same genes as superhuman tight end Vernon Davis. The concerns were about the finer points of playing the position, and Davis did little to alleviate those concerns during most of his time in Miami. At 26 and in a contract year last season, we got the version of Davis so many thought was possible when he entered the league. He’s still a specimen, but in 2014, he was also a steady presence for the Colts week in and week out. What makes him really special, though, is that he’s capable of games like the one he had in the divisional round against Denver. It’d be difficult to play cornerback better than Davis did that afternoon; all day, Peyton Manning tossed balls that Davis batted out of bounds as he blanketed both Demaryius Thomas and Emmanuel Sanders. When Manning challenged Davis over the middle on a throw to Andre Caldwell in the fourth quarter, Davis played the route so well that the ball looked like it was intended for him. The challenge is going to be whether Davis can shake the inconsistency that has dogged him and repeat last year’s performance. If he can, we could be looking at one of the best corners in football. When a player’s performance dives like Peterson’s did last year, there’s typically an issue we don’t know much about that’s at least partially responsible. When it was revealed that Peterson was diagnosed with diabetes midseason, it became clear why his play dropped so dramatically. With a full offseason to learn how best to moderate his health, hopefully we’ll see a version of Peterson that’s closer to the one we got before last season. Even that player, though, still has issues that keep him from reaching the same level as Sherman, Revis, and others. Peterson’s most persistent problem comes when capable route-runners get the jump on him with in-breaking patterns. A Calvin Johnson 72-yard touchdown in 2013 was a perfect example; Golden Tate also got the best of him during their first matchup that season. The troubles seem to come from a combination of footwork and physicality, which is surprising, considering how Peterson is built. At 6-1, 219, Peterson is actually more stout than some of the league’s monster receivers, but often, he ends up playing much smaller. 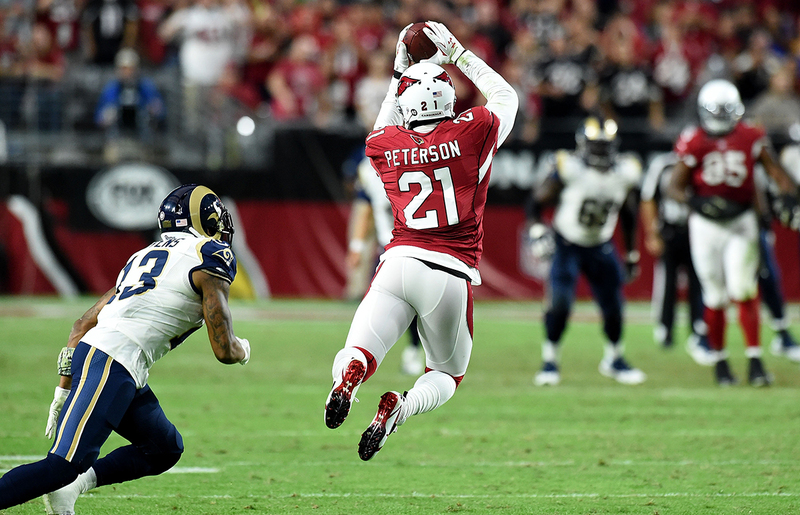 But it’s not hard to figure out why fans find Peterson fascinating, or why the Cardinals were willing to hand him a monster deal before last season. I don’t know if any cornerback in the league can make plays like this one from Week 4 in 2013. Peterson’s hands are not of this world. If he gets his mitts on anything thrown close to his sphere, he knows what to do. There’s probably no single player with better physical tools; there’s just still a question about whether it can all come together for a guy who is somehow just 25 years old. In terms of pedigree, there’s no bigger gap than the one between Peterson and Chris Harris. While Peterson was a top-five pick from an SEC powerhouse in 2011, Harris was an undrafted free agent out of a Kansas program that’s become notably awful. Harris got his shot the way a lot of lesser-known rookies do — by playing in the slot. For three seasons, Harris spent a considerable chunk of time playing on the inside, where he was consistently the best slot corner in the league. Still, that’s a qualifier. Last season, Harris ceded the primary slot responsibility to rookie Bradley Roby and didn’t miss a beat. Some guys can just play. The time Harris has spent all over the defensive backfield in Denver gives him a well-rounded knowledge of where everyone is supposed to be at all times. This near interception against the Cardinals last season is the sort of play only a few guys in football would even be willing to attempt, and Harris almost pulls it off. The lack of recognition of Harris’s elite status is just another case of draft history informing how we think about players years into their careers. Even with a promotion to the outside, Harris is still asked to handle plenty of different tasks in the Denver defense. What makes Sherman unique is how much impact he can have on a team by doing just one or two things. Last season, the stats that opposing offenses put up against the Seahawks outside the right numbers — the area of the field that Sherman roams — look like typos. Teams attempted just 100 passes that way all season. That was the lowest total in the league, and for good reason. Seattle picked off six of those 100 throws and gave up the third-lowest completion percentage in the league. Teams know they just shouldn’t throw that way — so they don’t. To say Sherman is the product of the Seahawks defense would be unfair, but he’s benefited greatly from playing in Pete Carroll’s system. Like Peterson, Sherman’s weakness comes when he has to cover quicker receivers on in-breaking routes, but much of his work is done outside the numbers, where he really is the best. Sherman’s 6-3 frame allows him to cut off the space down the sideline — it helps that he knows exactly how to shrink the limited space a receiver has. He’s far from a burner, but his understanding of angles and those long arms mean he’s able to make up for just about any throw over the top. On his interception in the NFC Championship Game, it actually looks like Jordy Nelson has a step on him toward the end zone before Sherman makes up the ground, embarrassing Aaron Rodgers in the process. That’s the danger against Seattle. Few teams dare to throw Sherman’s way, and even when they believe they’ve found an opening, it doesn’t last very long. The debate over whether a corner can be the best in football without covering a team’s no. 1 receiver is so reductive that it’s not even worth talking about. Sherman does what is asked of him in Seattle, and much of the Seahawks’ success is a product of the ruthless efficiency with which the players execute their assignments. They dictate what the offense will do, rather than the other way around. For years, the Patriots have taken the opposite approach — they react. Last season, Revis gave Bill Belichick a tool he hasn’t wielded in years. New England didn’t ask Revis to do what he did so often in New York — shadow the best receiver on the field and let the 10 other guys figure the rest out — which is part of why the talk about shadowing a no. 1 guy is overstated. Against the Lions, the Patriots chose to bracket Calvin Johnson with a corner and a safety while Revis chased around Golden Tate, who was having the best season of his career. Sherman’s performance in the past two seasons has been undeniable, but at his best, Revis can still do more at a high level than any corner in the league. At 30, Revis is no longer the athlete he was pre-ACL surgery, but he doesn’t need to be. He’s a technician unlike any other cornerback in the league, and it allows plays like this to be the standard. What made Revis the class of the position once again last year isn’t what the Patriots asked him to do every week. It’s that they could ask him to do anything. Ironically, 2013 is the only season Flowers was selected for the Pro Bowl. Smith, for his part, did have an excellent 2014. Kansas City’s style of defense is perfectly suited to him.